← John Bernard Whittaker, rest in peace. 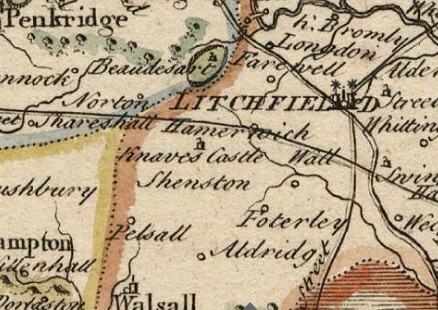 Blaeu’s map: Knave’s Castle was noted before Brownhills… from digDeeper. Following his comment this evening on my post ‘The past is a different place‘, the work of the enigmatic Paul has been engaging me all evening. His digDeeper site not only sheds some light on lost Brownhills earthwork, Knave’s Castle, but lots of other interesting stuff, too. I really liked his articles about surveyor’s benchmarks, Brinsford ordnance depot, and the lost village of Newdale. Like the excellent Tamworth Time Hikes, I’ve a feeling I’ll be returning to digDeeper frequently. This entry was posted in Brownhills stuff, Environment, Fun stuff to see and do, Local History, Local media, Shared media, Walsall Wood stuff and tagged Brinsford Depot, Brownhills, Brownhills local history, Cycle rides, digDeeper, Knave's Castle, local blogs, Local History, Newdale, Old maps, Ordnance Survey Benchmarks, Staffordshire, Tamworth Time Hikes. Bookmark the permalink. Thanks for the kind words. The benchmarks page has been updated with a slideshow, a little more has been included about Newdale and an interesting photo of Walsall Wood railway station has been added. Some of the above links do not work now! Go here http://www.digdeeper.org.uk and navigate around from there. You can buy it on-line: http://www.sahs.uk.net/page10.html or find it at your local reference libray/archives.